Brattleboro is not a diners' mecca, but there are plenty of congenial places to grab a bite or enjoy a sit-down meal, perhaps even with a pretty view. And it may be the only town in Vermont where you'll find Maple Baklava! Brattleboro's restaurants are scattered along US Route 5 from the shopping centers south of the town to the range of hotels north of the center. By driving along the highway, you'll pass most every one. Some of the best are, not surprisingly, right in the town center. The Whetstone Station Restaurant and Brewery, 36 Bridge Street, is Brattleboro's moderately-priced bistro-style brewpub by the train station on the Connecticut River. Peter Havens Retaurant in the town center at 32 Elliot Street, is the more elegant, upscale more expensive dining choice. 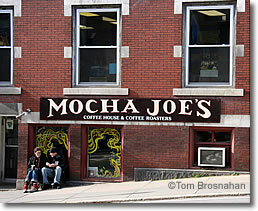 Mocha Joe's Café is a longtime favorite, roasting their own coffee daily, at 82 Main Street. The Marina Restaurant has one of the best locations in town: overlooking the bay at the delta of the West River where it meets the Connecticut, just off US Route 5 (Putney Road) 1.4 miles (2.25 km) north of Brattleboro center (the official address is 28 Spring Tree Road). The outdoor terrace seating is where you want to be in good weather.